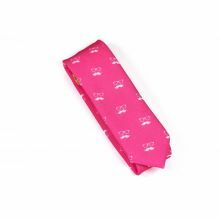 You will be sure to please with this pink necktie because, apart from its unique design, it bears the signature Colton Foster print. This fantastic bow tie is printed with a white glasses-and-moustachio motif. The Pink Necktie was designed by Colton Foster for the basic line and was created with our 100% polyester Burlington fabric and a 5 cm blade to give it a casual look.